In a Bronx Catholic school in 1964, a popular priest’s ambiguous relationship with a troubled 12-year-old student is questioned by the school’s strict principal. 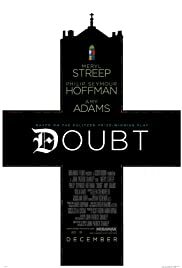 BEFORE: Wrapping up the Philip Seymour Hoffman chain is the 2008 Drama Doubt. It also features Meryl Streep (last seen in Kramer vs. Kramer) and Amy Adams (last seen in The Master, also with Hoffman). AFTER: I’m sure that even if you aren’t Catholic, or religious at all for that matter, you’ve still heard about Catholic schools and the ongoing child abuse scandal with the Catholic Church. From everything I’ve heard, Doubt seems to be a great representation of both of these issues. Sister Aloysius (Meryl Streep) is the epitome of what I think of when I hear a nun who is strict and disciplining. She has an eye for troublemakers and is firm with punishment, unwavering of her decisions or her assumptions of people. She is the person you do not want to see when you get in trouble. Sister James (Amy Adams) on the other hand is a kinder, more gentle nun who wants to see the best in people. Or if you want to think of it this way: good nun, bad nun. Everything I saw fit with my expectations of what a Catholic school would be like and it’s a job well done on director John Patrick Shanley’s part. Then you have the story. It’s a great portrayal of the child abuse scandal in the Catholic Church long before it’s apparent resurgence in recent days. I really enjoyed the momentum of this film with a well-crafted beginning and middle. Everything flowed well and seemed to go by quicker than normal (a good sign to if you find something entertaining). But then it gets to the ending and things fall apart a bit. Quite simply, the ending is very abrupt. To me, the ending felt like the end of Act II and I was awaiting another big shoe to drop, but alas, the entire film was finished and I was left with a desire for more. It was still a satisfying ending but it felt like more of a cop-out than it needed to be. All-in-all, Doubt is a fantastic period piece that depicts the Catholic Church and Catholic schools with an extraordinary level of detail. The story leaves something to be desired but there is quality acting throughout the cast especially from Meryl Streep and Philip Seymour Hoffman.